Ahead of his visit, PM Modi had said he looked forward to the opportunity of having an in-depth exchange of views. PM Narendra Modi met US Secretary of State Rex Tillerson ahead of his meeting with Donald Trump. Washington: US Secretary of State Rex Tillerson called on Prime Minister Narendra Modi in Washington today and discussed ways to boost India-US strategic ties ahead of the Indian leader's first meeting with President Donald Trump. Mr Tillerson met Mr Modi at the Hotel Willard Intercontinental, where Prime Minister is staying. Earlier, US Defence Secretary James Mattis had also called on Mr Modi. 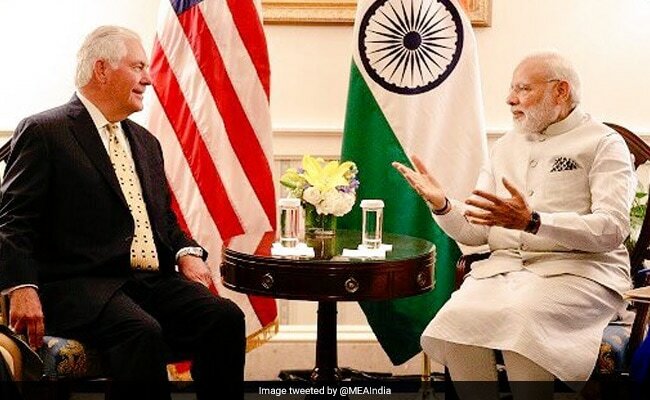 Ahead of Mr Modi's visit to Washington, Tillerson had said that the trip would strengthen the Indo-US relationship and help advance the common interest in fighting terrorism and promoting economic growth. Mr Tillerson had said this during a meeting with Foreign Secretary S Jaishankar last week. "The Secretary noted the Prime Minister's visit will strengthen ties between the United States and India and advance our common interest in fighting terrorism, promoting economic growth and prosperity, and expanding security cooperation in the Indo-Pacific region," a US State Department spokesperson had said. The two agreed that the two countries have a deep and growing strategic partnership and hope to work more closely on regional and global issues, the official had said. "My USA visit is aimed at deepening ties between our nations. Strong India-USA ties benefit our nations & the world," he had tweeted. "I look forward to this opportunity to have an in-depth exchange of views on further consolidating the robust and wide ranging partnership between India and the United States," the prime minister had said.